The ephemeral kings of the 14th Dynasty were not the only group to set themselves up alongside the main house at the end of the 13th Dynasty: a series of Semitic kings was beginning to assume control in the eastern desert and Delta regions of Egypt. These rulers, the 15th Dynasty, are known as the Hyksos, 'Desert Princes' (Hikau-khoswet), often inaccurately referred to as the 'Shepherd Kings'. Manetho's account of this period is preserved at great length in Contra Apionem by the Jewish historian Josephus, but it must be remembered that Manetho was writing as a Graeco-Egyptian about the greatest disaster that ever struck ancient Egypt: rule by foreign nationals. 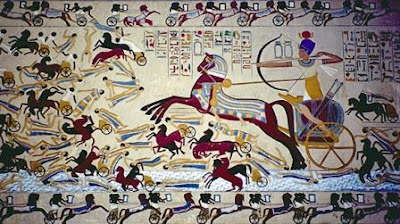 While later Egyptian records suggest a great invasion of a desperate horde through the eastern Delta, in reality Semitic immigrants had been steadily entering Egypt for some time. This is evident not only from the names recorded on Middle Kingdom stele and in some lists of servants, but also from the 12th Dynasty paintings of Asiatics in the tomb of the noble Khnumhotep II at Beni Hassan in Middle Egypt. These settlers gradually acquired increasing authority, but it was not until late in the 18th century BC that they began to extend their rule beyond their base at Avaris (the modern Tell el-Daba, currently being excavated by Manfred Bietak of the University of Vienna). The five (possibly six) main Hyksos rulers identified by Manetho are allocated a span of 108 years in the Turin papyrus, the lengths of their individual reigns being uncertain. Unfortunately, most of the Turin papyrus is damaged, and the figure given for Sheshi, the nominal founder, may be 13 or 23 years; likewise his successor, Yakubher, may have reigned for either 8 or 18 years. The longest reigning king was the fourth in the sequence, Auserre Apepi I (also known as Apophis), who ruled for about 40 years. The Hyksos sacked the Egyptian capital of Memphis in about 1720 BC, but they still preferred to operate from their eastern Delta strongholds such as Avaris and Tell el-Yahudiyeh. Appropriately for a people associated with the desert, they chose as their pre-eminent deity a god of the desert wastes, Seth. They also introduced other foreign gods and goddesses from their Phoenician homelands, such as the mother- goddess, Astarte, and the storm and war god, Reshep.